Day 11/12: Mary did you know? This song seems to divide people (into those who dislike it and those who love it). I’m somewhere in the middle regarding the lyrics. But this arrangement by the Pentatonix has such drama and beautiful harmony, it is definitely worth a listen. And in answer to the question, did Mary know? The short answer is yes, in some small measure, she did know who Christ would be and what he would do (see Luke 1:46-55 for details). No doubt the reality was both much worse and much better! For new believers with little exposure to the Bible, it can be one overwhelming book. I recently came across this ordered list of suggestions for reading the four gospels. It has much good reasoning. Luke, (like that new believer), never met or saw Jesus in the flesh. His account is “closest” to where that new believer’s feet are. Luke is like a “reporter”, repeating the events witnessed by the disciples and (according to a number of scholars), Jesus’ mother, Mary and John (the Apostle) her companion. The Gospel of Luke is descriptive and truthful in the telling of what Jesus did, what He said, and how He taught. Everything is there… the teachings, the parables, the private conversations, the healing, the triumphs and horrors. But there is little “sophisticated theology” or “flights of divine intimacy” in it. Like the Goldilocks/Three Bears story, Luke is a great start because it is neither “too shallow” nor “too deep” for the beginning swimmer. Mark next. Why? Mark’s Gospel was once described to me as “the travelogue of Jesus”. There is a hurried, breathless quality to it. An excitement to it. “And then we went there, and then He said this, and then He met them, and then this miracle happened….. And then we went there, and then He said this, and then they came, and then He did this…” repeat, repeat, repeat. The divinity of Christ comes to the fore, the authority and Godhead of Christ is made observable… along with a repeated theme of “but Jesus said, ‘don’t tell anybody about Me, yet!’” (which was consistently disobeyed). The water runs a bit faster with this Gospel… skills, balance, breath control, and strength are built swimming in this stream. Matthew next. Why? Matthew has ever been special to me. No one, but Paul later, deals so well with integrating the New Testament Jesus with the Old Testament Messiah. Matthew, as a tax-collector, was a pariah to his community. “Respectable folk” wouldn’t walk on the same side of the street as he, nor eat where he was eating, nor even sit on a chair he had occupied. And yet, when he wrote his Gospel, he did it in Hebrew! (All the others in Greek). His love for Israel, his dedication to the good news of their Redeemer, their Messiah, the fulfillment of ALL the prophecies, cries out from every page of this Gospel. Matthew misses no opportunity to integrate the prophets with Jesus’ ministry. I suspect no heart in Israel knew more joy ever, than the day Matthew was called into the Company of the Savior… for I believe he loved Israel, and the God of Abraham, Isaac, and Jacob… with all his heart. The water gets deeper here, the Old Testament, the prophets, the history, begin to weave into the threads of Jesus’ day to day life. The new believer watches the Old Testament light up in its foreshadowing and preparation for the coming of Jesus. Deeper water, yet manageable currents. And LAST, let us come to the Gospel of John! He was the youngest of the disciples. He had the “least to unlearn” as Jesus taught him. He went everywhere (nearly) with Jesus, and he was one of the “faith choir” Jesus took with Him when a miracle required much faith. John’s experience of Jesus, the intimacy of it, the depth of it, the understanding of it… was unlike anything we can imagine. John puts the reader on notice from the very first line… that they’d best strap in, ’cause it’s gonna be quite a ride… John’s head was far more Greek than Israeli! He flows with concepts of “essence”, “ideal”, “accident”… with the mutability of words as essence and essence as words, like a tadpole in a pond! I mean, seriously… look at the very FIRST PARAGRAPH! Seriously? SERIOUSLY? Scholars are STILL debating how to understand all that, and it’s been two millennia! John saw directly into the Divine! Jesus got to him young enough that when Jesus said “here’s how you do this… here’s how you SEE… here’s how you PRAY…”, John didn’t have to shake his head, walk away, and say… “Gosh, that’s not what Rabbi Nicodemus said… I wonder which is right?” John just believed Jesus, tried it, and found that it WORKED! Hoorah! John learned meditation and contemplation before he could probably SHAVE! So… the Gospel he wrote, is filled with the insight, the recollections, the perspectives he recalls from his embrace as the “disciple most loved” (i.e. the disciple most capable of experiencing love)… Therefore, his Gospel is the most “ethereal”, the most “contemplative”, the most “mystical”. 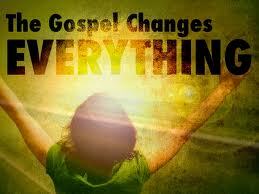 The Gospel changes everything, it’s changing me! Sharing today two simply beautiful songs which seek to share the message and the hope of the gospel of grace. They are from two different writers and bring two different perspectives. The first is about the changes Jesus has made both to history and the heart of the person he rescued. The second song focuses on the manner by which Jesus went to the Cross and took our shame, the perfect man showing perfect love to the unworthy (in just 4 lines). © 2002 Sovereign Grace Praise (BMI)/Sovereign Grace Worship (ASCAP).